I had absolutely no idea what I should make for dinner tonight. I was moments away from declaring it a buttered noodles night when I spied this beautiful trout from Panama at my local purveyor of fine fish. I had also recently seen the Panama episode of No Reservations so I fancied myself something of an expert on this country that I've never visited. 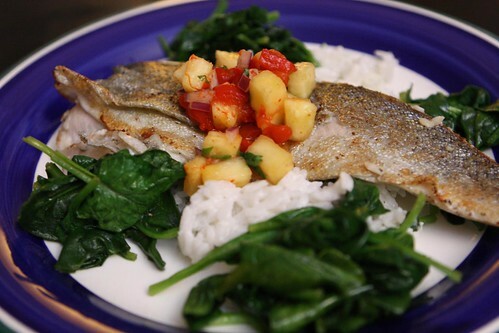 I pan roasted the trout to get the skin nice and crispy and served it over a bed of coconut rice with cilantro. I also sauteed up some spinach and made a simple pineapple salsa with pineapple, roasted red pepper, red onion, cilantro, cayenne, rice vinegar, and salt. I have no idea if this is the sort of thing that they'd do in Panama but it seemed entirely possible. I'm pretty sure Anthony Bourdain mentioned something about coconut rice in that episode so as far as I am concerned this is a 100% truly authentic Panamanian dish that would have been served to Noriega's dinner guests as they listened to him tell them about how much he hated the music of Bruce Springsteen. 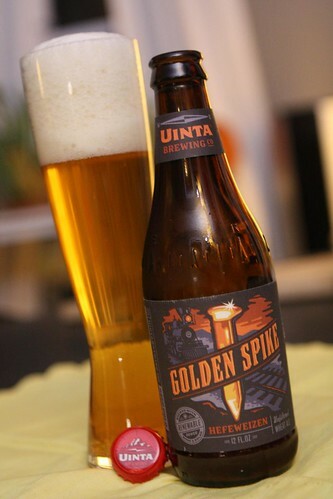 Long before I started making this quick dinner I cracked open this Hefeweizen from Uinta Brewing which I've been mistakenly calling Unita for the past month or so. I recently had their pale ale which was one of the best beers I've ever had. The hefeweizen was not quite at that level but it was decent. It was bottled a little less than three months ago so I probably could have had it a little fresher. I'm just not sure February is the right month for hefeweizen. However, it did snow today and we got an accumulation of a little shy of two millimeters before melting twenty minutes later. I got these New York State Cortland, Jonagold, and Crispin apples so I figured I'd make a giant pot of applesauce since it's one of Jen's favorite things in the world to eat. 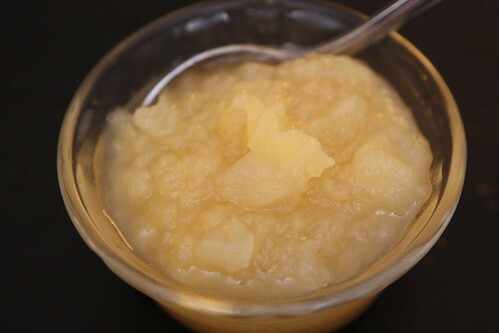 I used equal parts of each apple, peeled and chopped them, and cooked them down with just a little water. 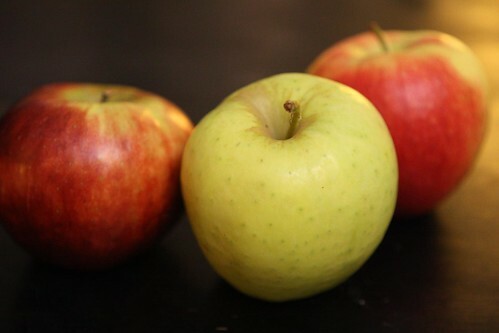 Jen and I have completely different tastes in apples. The Jonagold was my favorite of the three while the Cortland was her favorite. Our only common ground was in ranking the Crispin as two out of three. Want to know the secret to a long marriage, folks? I'll tell you. It's all about finding your apple common ground. And never go to bed angry.